During the 18th Century, the Electorate of Saxony was a rich state of the Holy Roman Empire. Northern Saxony was one of most fertile parts of Germany, though fertility diminishes toward Ore Mountains of the south where Saxony long had important mineral production. The House of Wettin ruled Saxony since 1429. Between 1697 and 1763, the Electors of Saxony were also elected Kings of Poland. The Elector Frederick August I (12 May 1670-1 February 1733), also known as “Sun King” of Saxony, was elected King of Poland with the support of Austria and the help of Russia when the former King Stanisław I Leszczyński, supported by France, was forced to flee after the Swedish defeat of Poltava in 1709. The Elector married Maria Josepha, sister of the Emperor Charles VI of Austria. The Emperor, having no male heirs was obsessed with the partition of the vast Imperial territories after his death. He issued on 19 April, 1713, an edict to ensure that the Habsburg hereditary possession could be inherited by a daughter, the Pragmatic Sanction. Frederick August I recognised the edict. When Frederick August died in 1733, Leszczyński, the archenemy of the House of Wettin, with the support of France and Spain, contested the election of Frederick August II of Saxony as King of Poland. This led to the War of the Polish Succession. The new Elector inherited an efficient and modern army. Forged by Field Marshall von Flemming on new lines between 1717 and 1727, this re-born army could match the other European countries. Frederick August II, aided by the Russian army and supported by Austria, managed to defeat Leszczyński’s supporters, and after a short but bloody conflict he was elected King of Poland. Next the Saxon army fought as an auxiliary in the Austrian service in Hungary against the Turks, and on the Rhine against the French. In 1741, Saxony reneged on the Pragmatic Sanction and sided with France, Bavaria, and Prussia when Frederick II of Prussia invaded Silesia after the death of Emperor Charles VI. The Saxons fought against Maria Theresia’s Austrian army during the First Silesian War, occupied Prague and campaigned in both Bohemia and Moravia. Thereafter, Prussia signed a unilateral peace with Austria. Saxony signed a separate cease-fire and France was left alone. Years of armed peace followed until the Second Silesian War. During the war, Saxony sided with Austria. The Prussian army crossed the border and invaded Saxony. The Saxon army was badly defeated at Kesseldorf on 15 December, 1745. The Second Silesian War was over. Peace once again reigned in Europe until 1756 when France changed alliances. Frederick II of Prussia launched another preventive war and invaded Saxony. Caught totally unprepared, the Saxon army retired to Pirna where it was surrounded by an overwhelming Prussian force. With no food, the Saxon army was forced to lay down its arms and surrender unconditionally. The prisoners were incorporated into the Prussian army. A massive desertion followed and soon a Saxon Corps was formed in Bohemia. The Saxon Auxiliary Corps of 10,000 men was transferred to French service and fought until the end of the Seven Years War. It was repatriated in 1763. 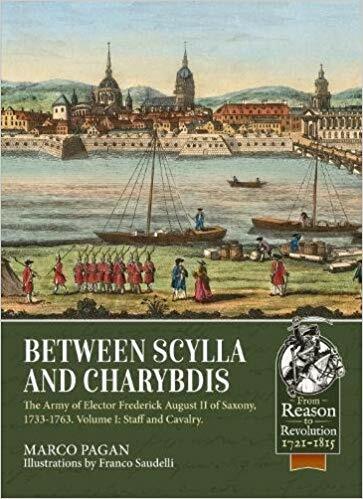 Volume I of this work deals with the Saxon army of the years 1730-1763. The campaigns, the commanders, the guards mounted units, and the line cavalry units of this overshadowed army are treated. 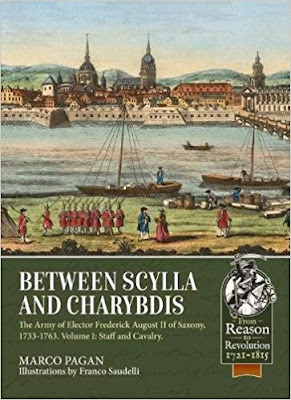 Lavishly illustrated by Franco Saudelli, the volume shows the elegance of the Saxon army and particularly an army misjudged by Frederick II of Prussia as “weak”.